Those against whom the case has been registered include Nooranad Praveen, an RSS pracharak. However, protests did turn into a BJP vs CPM issue on January 3 when protesters resorted to violence. After days of widespread violence involving BJP-RSS and ruling CPI(M) workers, 1,869 cases were registered by Sunday and 5,769 people arrested. Chief Minister Pinayari Vijayan made his government’s stand clear by asserting that the state government had a constitutional duty to implement the September 28 Supreme Court order allowing women of all ages into the shrine to offer prayers. He said they would not be cowed down by threats of “constitutional consequences” for Sabarimala violence. Vijayan asked the BJP national leadership to instruct its cadre in Kerala to stop creating violence in the state. “The state has a constitutional duty to implement the Supreme Court order. There is no violence other than the ones created by the RSS, BJP and the Sangh Parivar. And now they are threatening the state with constitutional consequences,” he said in a Facebook post. The post came on a day Union minister Smriti Irani had alleged that the CPI(M)-led LDF government was arresting BJP workers for raising their voice against the state. BJP national spokesperson Narasimha Rao had warned the state government that it would have to face constitutional consequences. Vijayan also alleged that the Sangh Parivar was trying to implement the same methods that they tried in northern India. “Sangh Parivar was trying to implement the same methods which they have tried on northern India. It’s not going to succeed in Kerala. 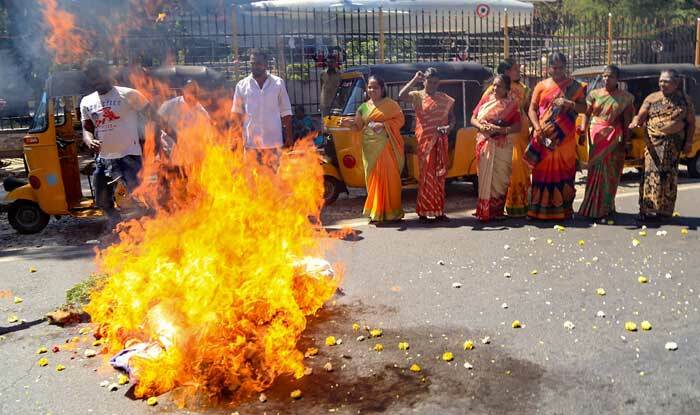 The state will deal with all kinds of attempts to create violence and communal riots with iron fist,” Vijayan said. The Nair Service Society (NSS), an organisation of the Nair community, has attacked the state government over the entry of young women into the Sabarimala temple, saying it was making planned move to impose atheism on the people. After a meeting on Sunday, the Travancore Devaswom Board (TDB), which manages the Sabarimala temple, directed Tantri Kandararu Rajeevaru to provide his explanation within 15 days for performing the purification ceremony after the two women — Bindu and Kanakadurga — entered the temple on January 2. The purification ritual is against the Untouchability Offences Act. “Any action against the Tantri will be taken after getting his explanation which the board has sought,” the minister said. The entry of two women in their forties to the hill shrine, the first time since the Supreme Court in September last year lifted the ban, had triggered massive protests in Kerala.